For Andrew and Heather's wedding, the couple had hired Norton Grounds Farm for both their morning preparations, and the wedding reception itself. Heather and the bridesmaids were getting ready in a cottage a couple of hundred metres from where this image was taken, and I had spent most of the morning with the bridal party. In our pre-wedding meeting, Andrew and I had agreed a time that he wold start getting dressed, in order that I could leave the bridesmaids for 20 minutes and take some photos of Andrew with his groomsmen. At the pre-arranged time, I made my way over to the farmhouse 'Norton Bank' where I met the groom and his best man and ushers. 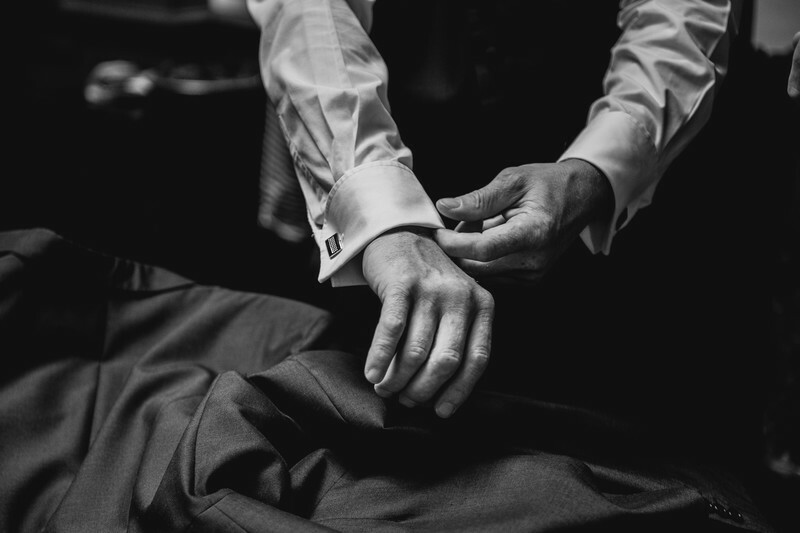 Compared to the bridal preparations, the groomsmen typically take next to no time at all to get ready. On average, a bride and 4 bridesmaids who have their hair and makeup done my professionals, will take 5 hours from starting in the morning, to being ready to walk down the aisle. In 12 years of photographing weddings, I've not known a groom take more than 20 minutes to get ready! 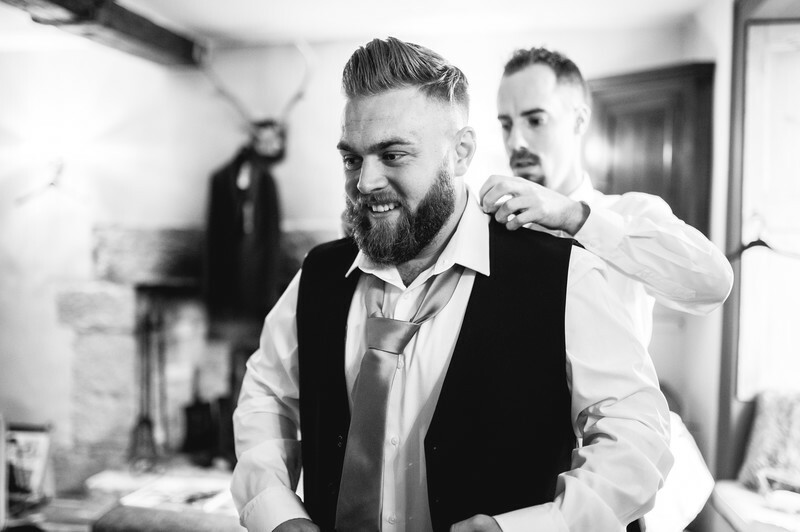 The main image shows the best man having his tie adjusted by one of the ushers. As odd as it might sound, the groom or ushers struggling to tie their shoes or tie is actually a good thing. Without that little extra time to get some photos, it's actually quite hard getting a photo of everyone. If the groom struggles to do his cufflinks for example (something anyone with shaking hands usually has problems with) it gives me extra time to get some image of this. The ground floor of Norton Bank has a large bay window that fills the space with gorgeous natural light, providing just the right amount of contrast for photography. 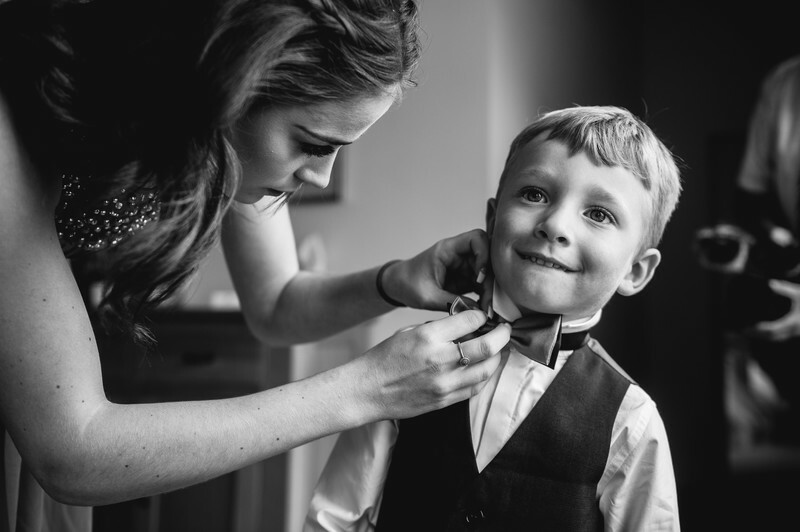 Because of the decoration of the room, and the directional quality of the light, Norton Bank is a great location to create some beautiful back and white photos.